If you’re ready to tear down your outdated, 60s-style vanity and replace it with custom bathroom vanities and cabinets, you’ve come to the right place. But before you actually pull out furniture and tear down walls, you need to first think about the basics of what you want your bathroom to look like and how you will actually use the space. Decide on your preferred cabinet style. You want to first determine what your preferred bathroom vanity and cabinet styles are. For instance, do you like mid-century modern, antique, contemporary or vintage furniture styles better? Do you want your cabinets and vanity stained or painted? Once you get these details down, you can move forward. Design for your needs. If you have children, think about adding in a pull-out step stool at the bottom of your cabinetry. This saves space while also increasing function! Really think about how you’ll use your bathroom storage. Design drawer depth and cabinet height for your specific needs. Perhaps you have a lot of hair care products that need hiding? Or perhaps you want to add a more spa-like feel to your bathroom, in which case you should consider open cabinets for towels and vases. Make the most of your drawers. Consider custom storage options to hold your hair dryer, curling irons and other hair styling equipment. Or perhaps custom drawers designed to separate your personal items in easy-to-find sections. Determine the right amount of cabinetry for your storage needs. Do you want floor-to-ceiling bathroom vanities or do you want an open countertop with room for special lighting and decorative pieces on your walls? Consider segmenting your space for easier access. If more than one person needs to use the bathroom at any given time, consider separate areas for grooming, washing hands and brushing teeth. Or consider separate vanities that mirror each other in design and layout. Finally, don’t be such a square! 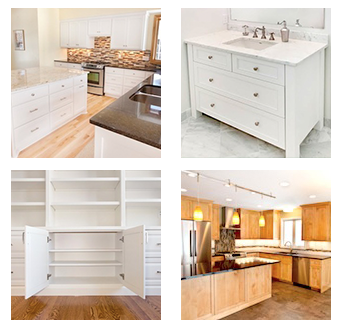 Think outside the box when it comes to shape and curvature of your cabinetry. You need not sacrifice design for the sake of usefulness! If you’re not really sure about much or any of the above, don’t worry! 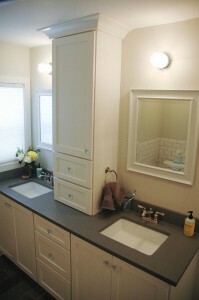 We have a team of experts who handle the design and build of custom bathroom vanities and cabinets on a daily basis. Give us a call at 952-737-7088 to schedule your in-home consultation, during which we can discuss with you your preferences and your options. Or, if you think this list isn’t comprehensive enough for homeowners seeking help with their custom bathroom vanity design project, we welcome your additions in the comments section below.